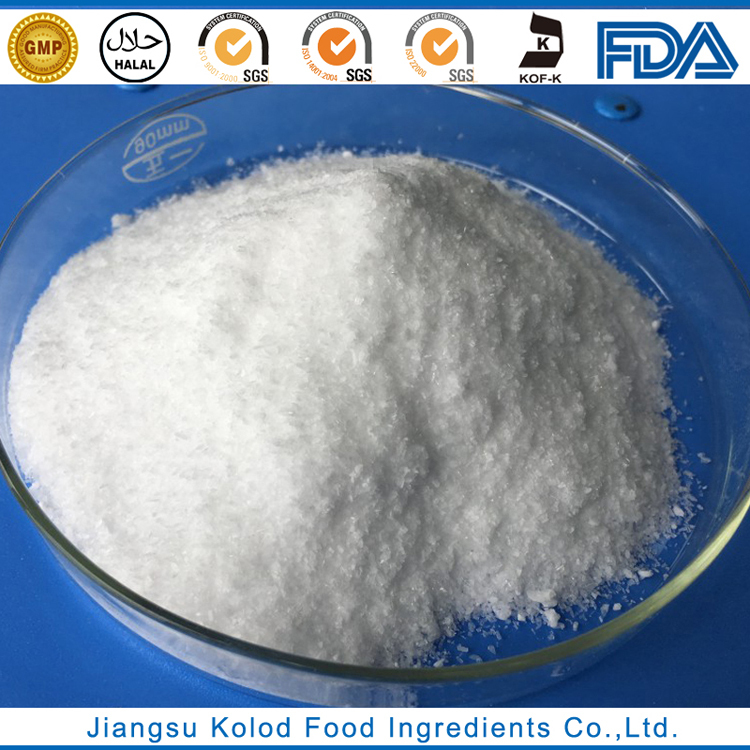 SODIUM ACETATE | Jiangsu Kolod Food Ingredients Co.,Ltd. Welcome to the online message! Please fill in your contact information and suggestions! Thank you! 5、Character: Trihydrate: It is colorless transparent crystal or white crystalline powder. Relative density is 1.45. In warm and dry air, it’ll easily get weathered. 1g sample could be dissolved in about 0.8mL water or 19mL ethanol. Anhydrous: It is white crystalline coarse powder or block. It’s odorless, tastes a bit of vinegary. Relative density is 1.582. Melting point is 324℃. Capacity of moisture absorption is strong. 1g sample could be dissolved in 2mL water. 6、Usage: It is used as buffering agent, seasoning reagent, pH regulator, flavor agent, etc . 7、Packing: It is packed with polyethylene bag as inner layer, and a compound plastic woven bag as outer layer. The net weight of each bag is 25kg. 8、Storage and Transport: It should be stored in a dry and ventilative warehouse, kept away from heat and moisture during transportation, unloaded with care so as to avoid damage. Furthermore, it must be stored separately from poisonous substances. We offer our customers from around the world to maintain a very good communication and product support services. Copyright © 2018-2019 Jiangsu Kolod Food Ingredients Co.,Ltd. All Rights Reserved.